Now that you have established your emotions-identity-motives atmosphere, you need to add your values-resilience-courage atmosphere to your achievements. The values-resilience-courage atmosphere around you is what you created when you verbalised the "how to walk.." expression. Your created your-values atmosphere, your-resilience atmosphere and your-courage atmosphere and when you bring them all together they fuse into a single values-resilience-courage atmosphere. You should cause your mind to dwell inside that atmosphere. How do you do this? By attempting to feel, to perceive each atmosphere individually and then in an interrelated way. 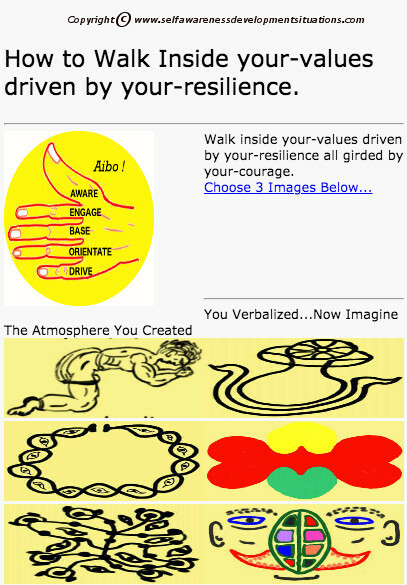 This interrelated atmosphere is your values-resilience-courage atmosphere, a subset of your entire mind's atmosphere. Make sure, in your mind, that you convert the image you see into an atmospheric visual of your-values from your chosen image and then apply your senses to feel and embrace the values atmosphere. Make sure, in your mind, to add to your values atmosphere Your-Resilience perceptions via your chosen picture and then apply your senses to try and pick up the enhancement of your values atmosphere with your resilience atmospheric component. Make sure, in your mind, that all your above atmospheric role players are surrounded by Your-Courage atmosphere. When you find yourself inside this composite 3 dimensional atmosphere you are strengthening your values-resilience-courage atmosphere to withstand contrary atmospheres while collaborating with like atmospheres in your relevant situations. 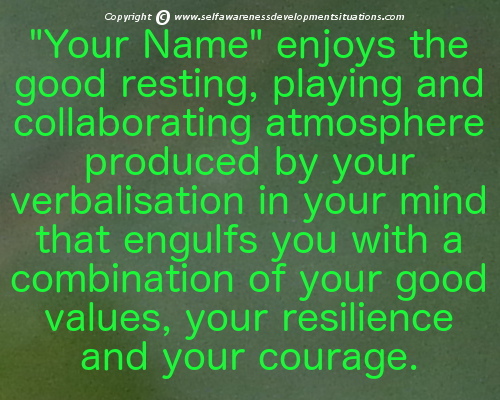 Make Real-time Consciousness of Your-valuesResilienceCourage Atmosphere In Situations Your Awareness Priority!